Sometimes we pick up a game for this blog just as a present to ourselves. Yes, part of the reason we’re delving into Morrowind today is that it’s a stop on the way to playing Peter’s preference, Oblivion, but another reason why I’ve kept pushing for it is that I’d only barely made it into the game last time I played it, but enjoyed the openness of it immensely. 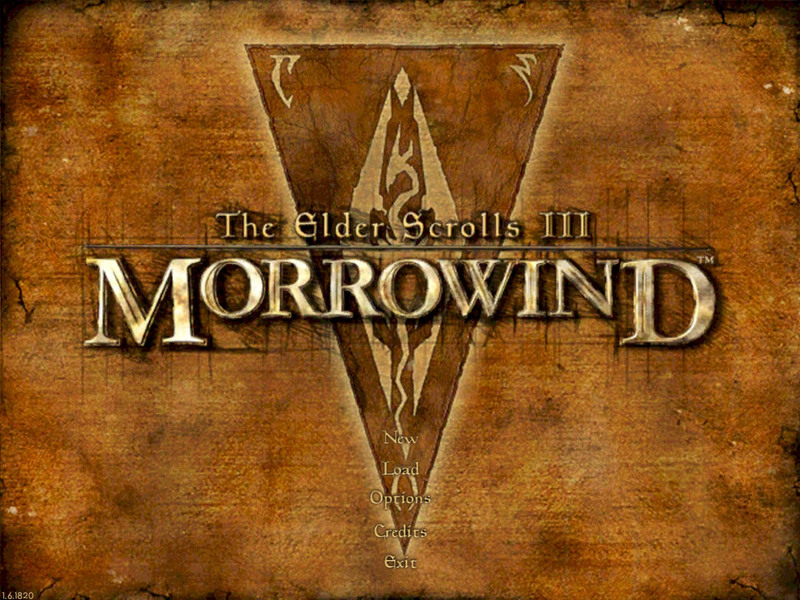 With the arrival of Skyrim as one of my birthday presents (and its inclusion as one of the games in the new 1001 list) our playing of Morrowind has been expedited even more… and not just to hear all the complaints about an arrow to the knee. So we get to dive into the third Elder Scrolls game, Morrowind. I’ve been thinking about playing the first two at some point, but having gotten into this, I must admit I’m not sure that’ll be worth it. Morrowind, in the mean time… well, worth getting back to already. Morrowind is a joy to play. It’s missing in the characterization that more story-driven games like Baldur’s Gate II brings, but its world adds so much more. 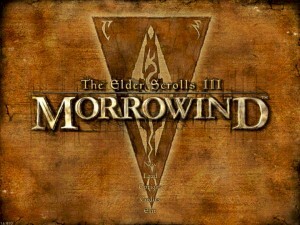 While other games take pains to fill their worlds – small worlds, of only a few screens per city and maybe two dozen cities and villages at most (see Fallout for an example of this), Morrowind creates a continent that takes half an hour to cross on foot, with many parts detailed and at least some hand crafting applied. The NPCs often share speeches for similar subjects, with only plot-specific items being more diverse, but there are loads of them. The beauty of these open world RPGs is your ability to just get lost in them. You start off a bit limited with that – you need time to grow your skills and get enough contacts – but once you get a bit of equipment and some skill increases under your belt, it’s a bit easier to explore and do your thing, opening up many things to do. I spent a large part of our playthrough just wandering through the world, taking in sights, avoiding and engaging with people, and discovering things that are out there. Out of nowhere, we stumbled into a mining village – no clue that it was really there, but enough to do there that you can meet some people, discuss things, help out and so on. We also tried to do some faction quests. Your place and standing in the world is partially influenced by who you get along with, and the game sports a large faction-mechanism, with each having questlines to play through that unlock benefits when you go through. Even the main quest, when you start it, is like this – you’re becoming a part of one of the factions in Vvardenfell, the province Morrowind takes place in. Visually, the game looks dated, with the slightly too stretched textures and blocky models. Certain areas have a tendency to look samey – it’s easy to get lost in some of the bigger towns, not because of size, but because the buildings and corridors have little to distinguish themselves. Add to that that a lot of the characters you meet do too – there’s just not a lot of opportunity for customization, and the limited options mean that most guards look the same, even if some are meant to be captains or such. But then, that’s what mods are for, and these days there is at least one mod that addresses this for Morrowind. Now, I am going to jump in here with a problem that I have had with a number of RPGs (not necessarily Morrowind) but our playthrough of this game reminded me of this. How is it that your starter character is unable to punch a scorpion when it is right in front of you. It doesn’t seem to matter that it can kill you in about three hits or that you are in possession of a massive club, somehow you find that pixel between their leg joints. /rant. What probably causes the most friction when playing this is knowing what follows. From what I know, Oblivion does most things better – bigger, more detailed world, more factions, more people. It sounds like it has its own balancing issues, but I do keep wondering why I’d try when the sequel does it better. Other than, of course, that I want to experience it all. Morrowind was released during a golden age for RPGs – with Bioware at its original peak, Deus Ex showing the hybridization opportunities of the genre, as well as some highlights of the genre on the Japanese side of things – Final Fantasy X seems notable in this respect, with the Playstation 2 seemingly a hotbed of them in general. With it, Morrowind led its own genre – the open world, sandbox RPGs. It’s not a coincidence that this was released less than a year after Grand Theft Auto III. While Morrowind has its fantasy elements and RPG elements, and GTA3 does more with its action elements, both have a ‘do what you want’ feel to them, where you can follow the plot if you want, or ignore it, explore and find other things to do in the world. It’s all up to you, and it’s a freedom that’s incredibly liberating, making for amazingly fun games.